iTunes is sweet, but iTunes can also be stressful. For instance, you might be trying to launch iTunes, but sometimes it would not yield to your efforts. It could be that you want to update it, but you keep getting an error message. You might have faced some painful experience trying to connect iTunes. Indeed, there are so many frustrations users encounter. However, we will give you the easiest solution to each iTunes issue. Now, we are going to discuss some iTunes not working problems and share ways to solve them. Pay attention closely to each solution as they will help you to solve the problem if you have one. You might face problem installing iTunes if you have installed it previously. You might be prompted to repair the software. The solution is simple. Follow the steps below to install and update easily. Step 1.Go to Window Control Panel and click on Uninstall a Program. Step 2.Tap on Apple Software Update and select Repair from the drop-down menu. Step 3.There will be on-screen prompts. Follow all to complete the repair process. Step 4.Once done with the repair process, restart Windows Software Update. Step 5.Proceed to install iTunes. Sometimes, you may face iPhone/iPad/iPod unrecognizable problem. It is nothing new, and it can be solved just by carrying out specific checks. If iTunes does not recognize your device, apply any of the suggestions below. 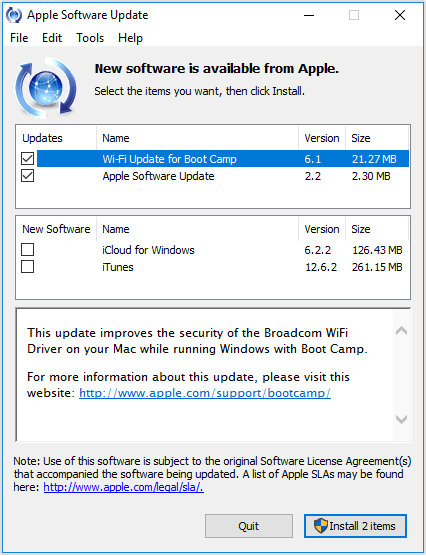 Suggestion 1.Check to see if you have the latest version of iTunes and if the program is compatible with your computer. Suggestion 2.Make sure you have the latest software on your computer so that your iPhone can work well with your computer. Suggestion 3.Check to see if the device is turned on. Suggestion 4.If you see a “Trust this Computer” notification, unlock your iPhone/iPad/iPod and click Trust. Suggestion 5.Check your USB cable to see if it is damaged. Suggestion 6.Try to restart your iPhone/iPad/iPod. Suggestion 7.Connect your device to a different computer. Suggestion 8.Do not connect your device to computer through an external USB port, but an inbuilt one. Every iTunes user will experience this iTunes not working problem at one time or the other. But, what can be done to this? Follow any of the suggestions below. Suggestion 1.Try to restart iTunes. Suggestion 2.Sign out from your iTunes account and try again. Suggestion 3.Re-launch iTunes and sign in again. iTunes may work after this. Suggestion 4.Uninstall iTunes and then reinstall it on your PC. Suggestion 5.Update your iTunes to the latest version. Suggestion 6.Restore iTunes to the previous version. It will work without quitting, and you can later download the latest version. Every iTunes user will experience this problem at one time or the other. But, what can be done to this? Follow any of the suggestions below. Step 1.Open iTunes and select a playlist. Step 2.Go to File and click on Library, then click Export Playlist. 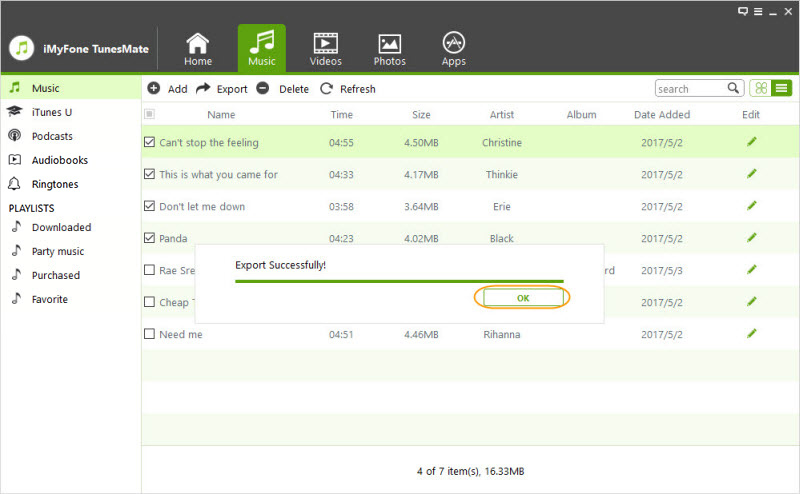 Step 3.Export the playlist in .m3u file. 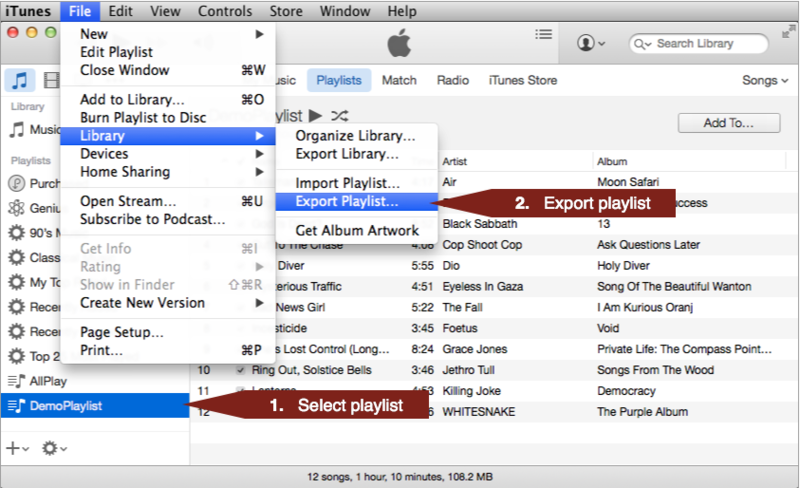 Step 4.Drag and drop the m3u file to where you want to import iTunes playlist. Make sure you have subscribed Apple Music. Still, if you continue experiencing this iTunes not working issue. Why not try some suggestions below? 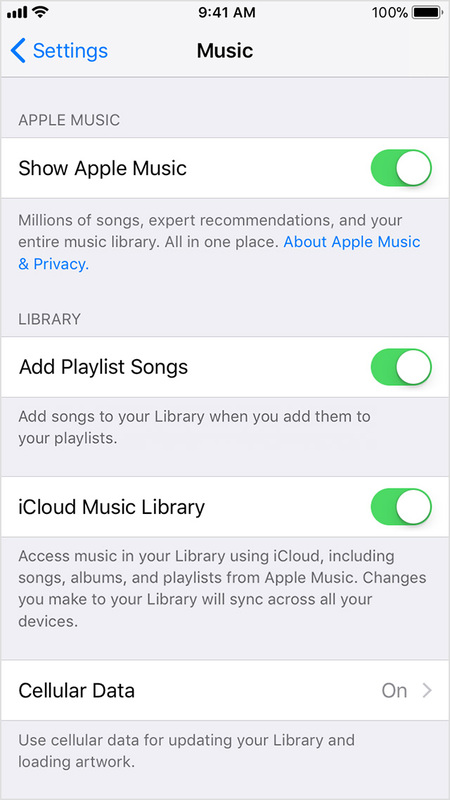 Suggestion 1.Check if you have turned on iCloud Music Library. Suggestion 2.Check if you log in with the same Apple ID that you use to subscribe Apple Music. Suggestion 3.Check if you have the latest iTunes on your computer. As you can see, there are many iTunes not working problems you may face. 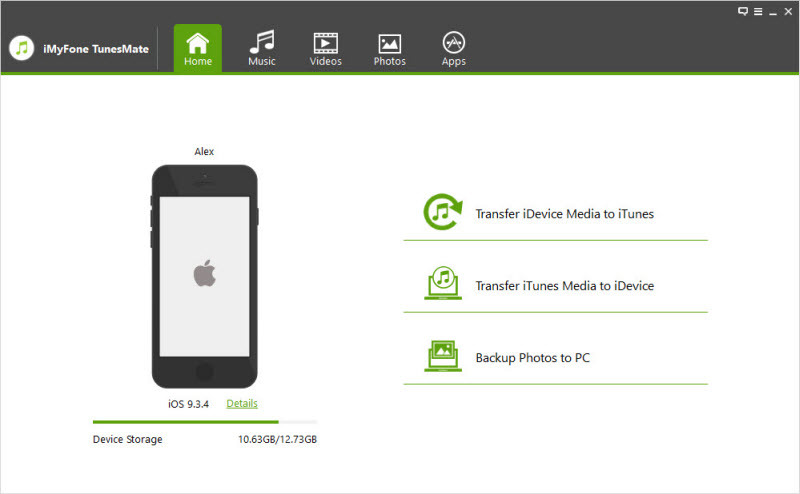 But, what if you get an ideal alternative to manage your iPhone and iTunes music? iMyfone TunesMate is the perfect alternative to eliminate all iTunes issues and ensures that you do not go through any complicated steps to fix them. 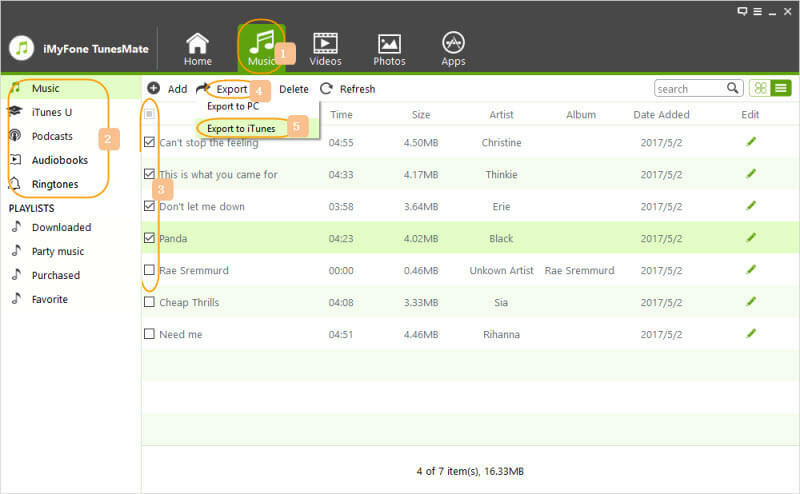 With TunesMate, you can add music from iTunes or PC and export back to the same location. You can even delete the music if you wish. Rebuild damaged and corrupted iTunes library to fix common iTunes problems. Free two-way transfer from iDevice to iTunes/computer and from iTunes/computer to iDevice to get rid of iTunes limitations and errors. Transfer media files from iPhone/iPad/iPod to iTunes without launching iTunes to avoid iTunes problems. Step 2.Click on "Music" tab at the top menu bar to load all your iPhone music. Here in music panel, you can freely choose Music, iTunes U, Podcasts, and Audiobooks from the left side bar. Check music files that you want to transfer from your iPhone to iTunes, and click "Export > Export to iTunes" to begin the transferring process. Step 3.It will take a while to transfer iPhone music to iTunes. When completed, click "OK" button in a pop-up window that shows "Export Successfully". Step 1.Launch iMyFone TunesMate on your computer, and connect your iPhone/iPad/iPod to computer with original USB cable. Step 2.Click on "Transfer iTunes Media to iDevice" tab on the home interface to scan all iTunes media files and show them in a pop-up window. Step 3.All iTunes media files will be checked by default. 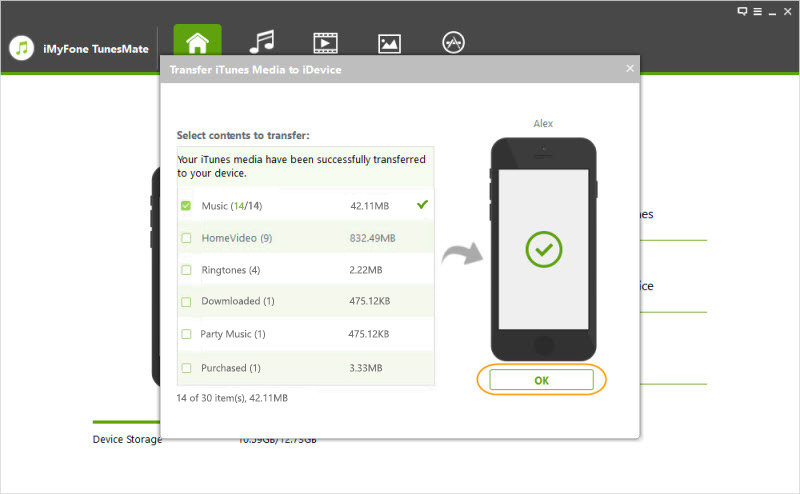 Freely select those you want to transfer and click "Transfer" to begin to transfer iTunes music to iPhone/iPad/iPod. Finally click "OK" to complete the whole process.